During SOMETHING WONDERFUL, host Ted Chapin informed the audience that on Hammerstein's 100th birthday, a Hammerstein song would receive its premiere. Chapin explained that in 1994 archivists at the Library of Congress discovered among Hammerstein's collected papers a missing piece to a long-perplexing puzzle: a complete music and lyric manuscript for "Suddenly Lovely," a song written for Lt. Joe Cable in SOUTH PACIFIC and cut from the score. 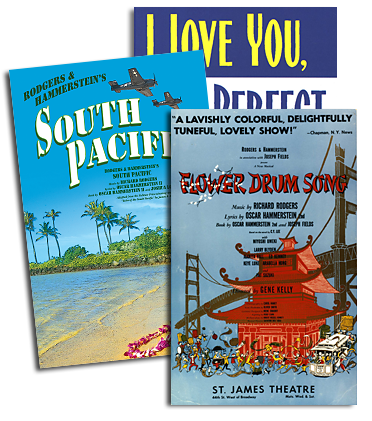 Years earlier, SOUTH PACIFIC director Joshua Logan had suggested that the melody from another cut song from SOUTH PACIFIC called "Suddenly Lucky" had provided the music for THE KING AND I's "Getting To Know You." However, when "Suddenly Lucky" turned up in the files, its lyrics did not fit the melody we have come to know. In '94, however, "Suddenly Lovely" was found and - voila - a perfect match. The previously unpublished lyric to "Suddenly Lovely" follows. We present it to you as a historical anecdote finally corrected, and as another fascinating insight into the creative process of the Rodgers & Hammerstein collaboration. Warning: do not interpolate this into your next production of SOUTH PACIFIC - "Younger Than Springtime" is far better! Suddenly my life is lovely. Ev'rything we hear and see. Are we in love forever and for good? Are we happy as we could be? Williamson Music. All rights reserved.